1. The Ska Vengers have a well-rehearsed shtick that serves them well. And they always have a gimmick or two that they’ll pull out of their hats (because they all wear hats; get it?). But beyond that, one thing that the band has always been very particular about is using their music to effect some kind of social change, however tiny it may be, which is obviously commendable. In the past, they’ve been vocal about the treatment meted out to Dr. Binayak Sen. (This writer remains unsure if coming out in support of Sen would land him a sedition charge so he’ll refrain). Moving on, ‘Modi, A Message To You’ retains that same idea of defiance, as the song – along with its new animated video – attacks Modi for many of the questionable things he has [allegedly] done during his tenure as Chief Minister of Gujarat. 2. Speaking about actual matters that have relevance, beyond puppy love heartbreak and getting’ high, is a rare phenomenon in our fledgling rock music community in India. The way things are going in the country, freedom of speech is a precious commodity and anyone trying to practice the dark arts of actually speaking their mind (regardless of how caustic their views may be as long as hate speech isn’t involved) – the Ska Vengers in this case – should be encouraged. Sure, their message to Modi will only reach fans of Hauz Khas village and of the band and of Reggae Rajahs, which might be a lot but not nearly sizable enough, and not really falling in the economic and social bracket where the critical mass of the country lies, but that shouldn’t be a deterrent against staying mum. Change starts with one and all that. 4. 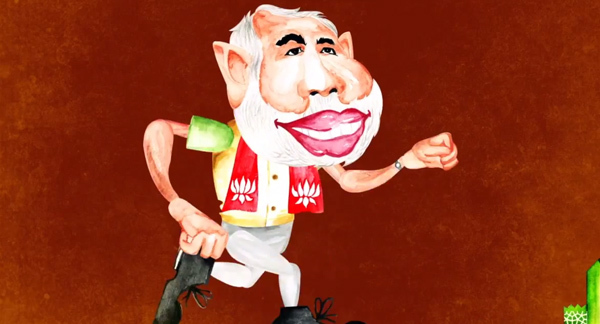 As for the content of the video, there’s an animated, caricatured character that resembles the CM of Gujarat. He’s running, running, running. Trampling over small huts while massive factories appear. Pumping up the development figures of Gujarat. Flying on his little Reliable Airlines charter plane. Putting people in jail. There’s a hapless television news reporter chasing after ol’ Modi, trying to confront him about his actions. But true to form, the Modi machine never stops, relentless in its forward march with not a second where his smile goes away. 5. 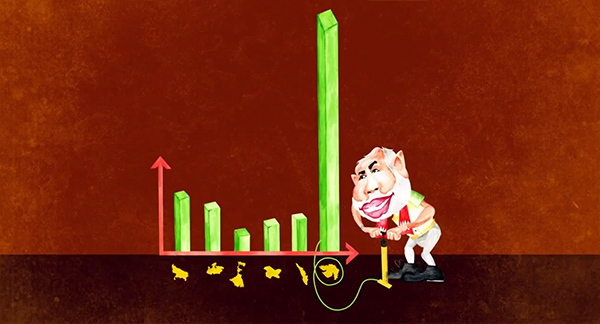 The message to Modi on one side, the aesthetics of the video are visually quite appealing, with staccato, cartoonish animation and a lively colour scheme serving as motifs that run through the video. The short, flowing rhythmic vibe of the song is captured tastefully in the roving, constant motion that the narrative of the video presents. 6. There is an absence of nuance in the storyline of the video, and predictably so. That’s not necessarily a negative thing – the lyrics, the song title itself, the narrative of the video are all straightforward enough in their intent. The tone is clear-cut and forthright, which doesn’t leave much room for the trickier subtleties that satire demands. Instead, we get hilarious lampooning. 7. The way the main character has been crafted makes him almost endearing. The warm smile, the dedication to strive forward at all costs and destroy all in his path makes him seems charming and likeable almost. But that’s only if you ignore his actions in the video and all the other very bright and colourful information that’s presented. 8. As mentioned above, the Ska Vengers have always been inclined to participate in the country’s functioning through their art. There might be many sticks to beat them with, but indifference (or cluelessness about what’s happening around them) isn’t it. This writer does reserve judgement on whether this aspect of their musical identity is a gimmick or not, but would rather hope that it isn’t – it seems like it isn’t for what it’s worth. And when you look at Ska Vengers vocalist Delhi Sultanate’s Word Sound Power, you see that change is possible. 9. Sticking to that same thread, there are conversations – heated debates – on politics, society, discrimination, governance, or law and order at every gig while the opening band plays. Bands and musicians in the country seem to be well-read and aware enough of what’s happening around them, and Facebook feeds certainly point towards everyone having strong opinions. So why don’t more bands write lyrics about social matters? Why isn’t protest music a part of the musical jargon of the independent mostly-English music community yet? Why aren’t more artists using their art as a tool to make a difference? This isn’t a ‘bemoaning the state of affairs in India’ type of a point. It’s a genuine question, not even a concern. This writer has never been particularly pro- or against using music as a tool for social change – although it does have its merits – and is more curious than disappointed over why bands generally sing about love, life, peace, understanding, depression and happiness, without really tackling the reality of India and the condition our country is in. Is it ennui or apathy? (Something that I can completely understand.) Is it fear of your dissent being crushed by the powers that be? Is it self-entitlement? Is it complete fecklessness? Who knows. Every other kind of music – even the folk music traditions in India itself – will have its fair share of protestors and dissenters coexisting with the heartbreak-and-loneliness lyricists. So why the lack of it here? It would at least add some variety if nothing else. It’s a mystery is what it is. 10. As for the music, the horns section towards the latter half of the song adds a great new dimension to the music, lending it legitimate substance and weight.